Famous people born on NOVEMBER 18 are Scorpios who embrace the idea of a love that is true and stable. They value having someone there when they come home. Love is so very important to them… it completes their world. However, when they are upset or down and out, they tend to take this attitude with them to work. This is not good, Scorpio. They need to learn how to separate the two as this can be disturbing to their employer and co-workers but most importantly to their future as an employee. Consider it a challenge. They tend to go for a dare. Otherwise, they are a vibrant person. Famous people born on November 18 are passionate and affectionate. They’re exceptionally intelligent and talented. There’s no end to the good things anyone could say about them. They just need to stay focused on the big picture. The November 18 famous celebrities have the potential to do many things professionally if they so choose. When it comes to their health, they are actively pursuing a long and health life. They look good! Some people actually are jealous of them. 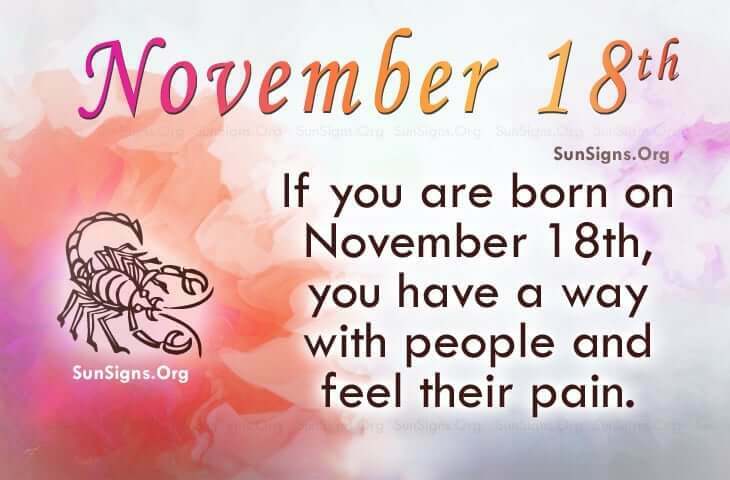 Famous people born on NOVEMBER 18th have a way with people and they have the ability to “feel” their pain. As a Scorpio birth date, they like challenges and are often motivated by personal satisfaction. Looking for love, they tend to want someone equal to their own values.